Green Valley Food Corporation was founded on the principles that every individual can and should live a healthy lifestyle. By offering natural, and non-genetically modified organically grown products, we hope that others can achieve this goal with us. 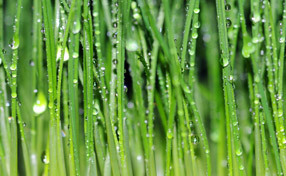 Green Valley Food Corporation has been growing sprouts of the highest quality since 1996. Consequently, we are considered sprout masters in the industry. We take pride in our high levels of customer service and top-notch products. 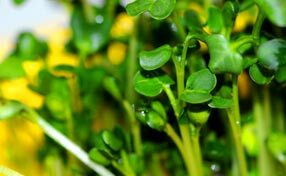 We offer an array of foods ranging from sprouts to wheat grass and tofu, all grown within FDA standards to assure our customers of safe and quality products. In addition to our products we offer or quality warehouse and transportation services for the Dallas and Fort Worth area. Let Green Valley Food handle all your warehousing and transportation needs wih the attention that all products need and require. Green Valley Food Corporation is committed to having superior products that follow the strict guidelines set forth by the FDA and the high standards of our customers. 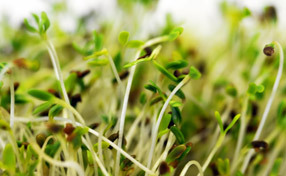 We are part of the GO TEXAN group of locally grown products and use certified seed by John Hopkins University School of Medicine for growing our sprout to the guaranteed level of natural sulforaphane GS (SGS), which supports long-lasting antioxidant and essentail cellular functions.